Roman theater of Volterra, 1950—1953. Marble Roman portrait of the emperor Augustus from the Guarnacci Museum, Volterra (room/sala XXVI). The museum is famous for its collection of Etruscan-period cinerary urns, but does contain a few examples of imperial portraiture which were found during the excavations of the Roman theater (Teatro di Vallebuona). 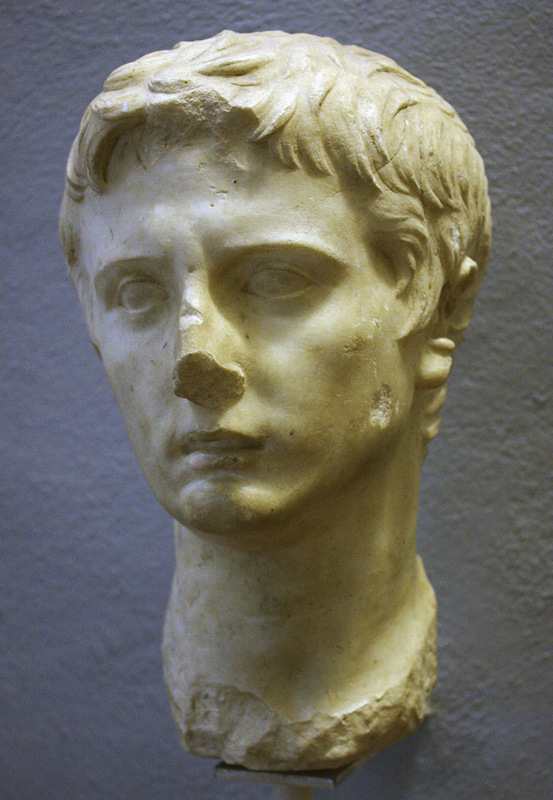 Two heads attributed to Augustus were found in the excavations. This one is designated by the museum as a head of “Octavian-Augustus” (thus perhaps to be dated before 27 B.C.). Note that the emperor’s mouth is depicted slightly open, as if in speech. Faint traces of paint remain on the eyes. G. Cateni, Volterra. Il Museo Etrusco (Pisa 2006): 78—79. © 2009. Photo, text: Roger B. Ulrich.